For Eaton Engineer Salam Baniahmed, leaving Wisconsin last year to work at the U.S. Department of Energy's (DOE's) National Renewable Energy Laboratory (NREL) in Golden, Colorado, felt like a homecoming. "I hadn't seen mountains in more than six years," said the Jordan native, who grew up near snowy peaks. Last May, he and his wife drove west just so he could savor the approach as the Rockies peeked over the horizon. "Looking at the mountains, I thought, 'I made the right choice,'" he said. Baniahmed is one of 17 Eaton employees who are co-located at NREL under a cooperative agreement signed last January between the laboratory and the multinational power management company. The partnership initially aims to boost research and commercialization for new energy-related technologies in the area of energy systems integration, such as microgrids, energy storage systems, and smart grids. "The idea behind co-location is that innovation happens when two people start talking about the completely different perspectives they have," said Eaton Director of Global Technologies Igor Stamenkovic, who arrived at NREL on April 2. The embedded workforce is just the latest chapter in a long history between the two organizations, which have collaborated for more than a decade on a portfolio of joint programs. Examples include projects to develop a predictive battery system for hybrid electric vehicles and to optimize energy systems for microgrids, buildings, and communities. For Stamenkovic, co-location was the next logical step. "Ten years ago, we had one area of collaboration—five years ago, two areas—and two years ago, five areas," he said. "Now, let's align even better and have 10 or 15 areas of collaboration." Success of the enterprise is not only about the total projects, however; it's about the speed of collaboration. The partners are testing a business hypothesis: By co-locating in NREL's Energy Systems Integration Facility (ESIF), can NREL and Eaton substantially increase the scale and pace of innovation? "NREL's people are fabulous, infrastructure is fabulous—but ESIF is really one of a kind in the world," Stamenkovic said. Eaton was drawn to the ESIF because it is a user facility designed to help NREL and its partners accelerate impact. “This is exactly what the ESIF facility was designed for—partnering with strategic stakeholders to accelerate the impact of the research conducted at the lab,” said Martha Symko-Davies, NREL's laboratory program manager for the ESIF. And while each Eaton employee may have a different reason for coming to NREL, they all have one expectation in common: blue sky—because of the open-ended nature of the engagement and the combined strengths of the two entities. "There's no expiration date," Stamenkovic said of the partnership. There are, of course, contractual limits, but ideally, "my team and I moved here with a goal to stay and live here," Stamenkovic said. "Leaders in both organizations envision this engagement as a special, long-term partnership." At the time of the signing, NREL Director Martin Keller said, "This on-site, direct collaboration allows our fully-integrated teams to expand knowledge related to grid integration and power management." Of course, for some, NREL was already familiar ground. Eaton Power Systems Engineer Vijay Bhavaraju, for example, had worked with the laboratory before. He'd co-written proposals and worked on hybrid vehicles with NREL staff, been part of a DOE-sponsored project at NREL's National Wind Technology Center (NWTC), and even overlapped on photovoltaic research at the laboratory. The bonds go deep. "We have been talking about NREL for years, using their tools and papers, so we had a great appreciation for it already," Bhavaraju said. "And a good relationship." The veteran engineer did have one bit of trepidation about moving from Menomonee Falls, Wisconsin, to Golden: "I thought we'd be going from cold to cold," he said laughing. "But it's so sunny—it's different." His first week at NREL in July confirmed that he was in the right place. "I starting writing a lot of proposals with NREL folks," he said. "I told Igor, 'Wow, what a great set of folks here.' It's a good thing when you work with people who are also talented. Much better atmosphere of research and enthusiasm to take it to the next level." The mere fact that two large organizations could move quickly to set up a co-location project—completing negotiations in less than a year—demonstrates the enthusiasm on both sides to advance next-generation solutions. "The hope is that we have sown the first seed to really get the whole series of technological innovations that we fundamentally believe is going to change how we manage electrical power," said Ram Ramakrishnan, Eaton executive vice president and chief technology officer. Progress is apparent. The Eaton space in the ESIF is being fitted out in cooperation with NREL compliance teams. Eaton equipment is in the laboratories and Eaton lighting systems are in place. Even personal touches are sprouting: One employee added a Michigan pennant to the side of her desk. "Eaton staff have settled in and recently have attained comprehensive lab functionality," said Greg Martin, NREL's engineering manager for the ESIF. "Eaton and NREL have worked together on definition of the safety envelope for activities and on coordination and support to make the joint work efficient." Like any new arrangement, there were growing pains and logistics to work out—but according to Yi Yang (a microgrid specialist whose first project as an Eaton employee nine years ago involved visits to NREL), there were no "deal breakers." "Our team is flexible and willing to accommodate uncertainties," she says. "And everyone at NREL has been responsive, so things have worked out." Yang—who grew up in China near the eastern terminal of the Great Wall and earned her Ph.D. at Georgia Tech—said there's been one unexpected benefit of acclimating to the new work environment. "It helped the team to bond because you work hand-in-hand to find answers together," she said. Despite a new address, they can retain strong ties to other Eaton divisions—something that comes with their role as members of Eaton's Corporate Research and Technology team. About 100 of those employees under Stamenkovic are already spread out over four countries on three continents. For Yang and other members of the Eaton team, the benefits of the move far outweigh any challenges. The new environment, they believe, is providing another kind of blue sky: the openness of innovation. The new Eaton-NREL collaboration already includes some concrete projects. The electrification of transportation fleets provides opportunities to optimize multiple distributed energy resource technologies, such as solar and energy storage. For example, one of the joint projects involves evaluating control strategies to manage electric bus fleets for grid services. And there's more to come. When Yang, Baniahmed, and others got to the laboratory in early May, DOE was releasing and abundance of funding opportunity announcements. Researchers explored where Eaton and NREL could come up with joint proposals. "We started pretty intensively with discussions," Yang said. "It was a good starting point for the dialogue." In the area of cybersecurity, Baniahmed said he works with "the hands-on, smart people here on a regular basis." Even without an established project in that field, "you never know when something comes up. In the near future, there will be a solid platform we can work on." The two partners already had one cybersecurity proposal together. Even though it wasn't selected for funding, "I think we have lessons learned out of this," Baniahmed said. He thinks that there are a couple of other projects that could take root in the near future. This budding relationship is important to NREL, too. "We understand the fundamental science that underpins the technology," said NREL Associate Laboratory Director for Innovation, Partnering, and Outreach Bill Farris. "But the real impact is felt when that technology hits the market." He explained that partnerships are a key part of realizing these market impacts—and relationships with companies like Eaton are critical to the equation. The benefits of this partnership aren't confined to NREL alone. As Baniahmed said, "Once I got here, NREL opened the door for me to talk with other national labs. It makes sense for me to interact with more people with my same interest—people that I would never have found before." 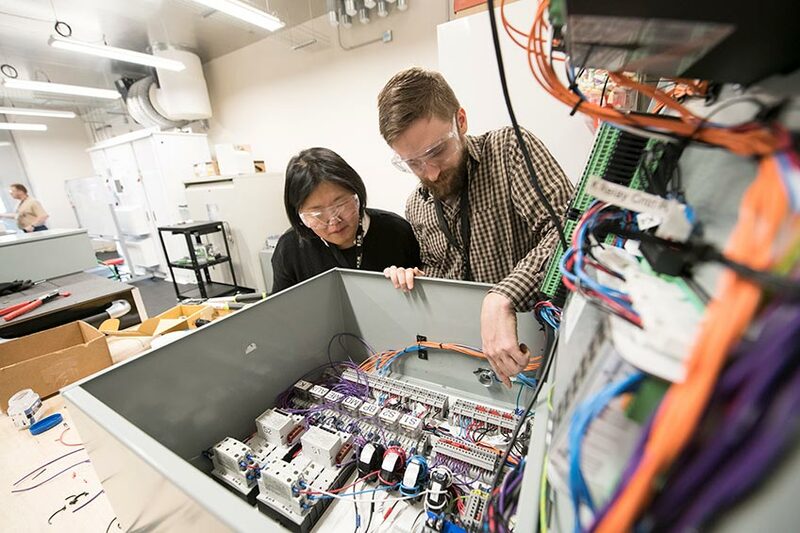 Another potential area of connection involves technologies that already exist at NREL but may benefit from Eaton's business-focused perspective. "We are looking at some technologies originally conceived at NREL," Stamenkovic said. "They are cool but may not yet necessarily have a compelling use case that would make customers want to bite." In one case, when attending a presentation about foresee, NREL's home energy management software, Stamenkovic and others at Eaton were impressed by its market potential. He expects this type of discovery to continue. "It's especially exciting to me to find a technology that is completely envisioned and developed elsewhere—in this case, NREL—and that we help commercialize it." While it is still early, the Eaton group is upbeat about what is coming down the road. "We've only tapped one part of the ESIF," Stamenkovic said. "Now we are looking into what kind of research we can do at the NWTC." "We are starting to introduce ourselves to other people," he continued. "You put all of it together and get these levels of collaboration, conversations, and innovation that never existed before." Again, such embedded encounters are "very hard to do if you only meet once a month for a couple of hours. Then a conversation is usually project-based, execution-based." As the Eaton family continues to settle in—Baniahmed gearing up to learn to ski, Yang eager to explore the mountains, and Bhavaraju enjoying hikes—the possibilities are as wide as the horizon in the West. "The environment allows us to interface with customers to test the value of any technology," Yang said. "You put yourself into someone else's shoes. I appreciate the company's vision in making this move. No one knows where it will really end up. It's a good opportunity for us to explore unknown territory." And those initial explorations are gaining notice. "In the first six months, we have heard from many—in utilities, DOE leadership, stakeholders—that they are excited about some of the new ideas," Stamenkovic said. And that sort of support, in turn, is amplifying the excitement about the Eaton-NREL partnership—and the potential of co-location at the laboratory. To learn more about NREL's energy systems integration work, visit the ESIF website.